Heart rate monitors are no longer the exclusive domain of fitness gadgets. The last 12 months have seen sensors make their way into smartphones and wearables, replacing for many of us the need for a standalone pulse monitor. The problem is a lot of these options have been unable to deliver accurate heart rate mesurements, partly because those sensors have to maintain contact with your skin; if they slip, then the readout skips. Maybe LG has the answer, then: Put heart rate monitoring technology into a pair of Bluetooth headphones. If you're like me and are constantly wired for sound during workouts, what could possibly be better? LG's Heart Rate Monitor earphones link to an iOS/Android app, with absolutely nothing burdening your wrists. LG's fitness app can even add your exercise sessions to a step counter, so long as you buy LG's optional Lifeband Touch fitness band. 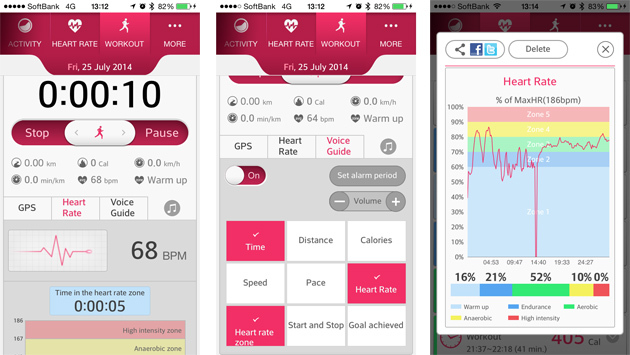 What's more, the app also integrates with other fitness apps like RunKeeper. It all sounds great on paper, but there's a problem: the headphones don't actually sound good. Let me explain. LG's new earphones are an interesting way of recording and monitoring your heart rate without strapping something to your wrist. If you typically listen to music while exercising, it's an even better fit. At this price, however, the sound quality isn't quite good enough. Be the first to review the Heart Rate Monitor Earphones? LG's new headphones look like run-of-the-mill sports headphones, but at $180, they're pricier. They're in-ear buds supported by rubberized tubing around the wire, which help keep them inside your ears. There's even an extra flexible wing to support the fit, ensuring they stay snug during your morning run or squat superset -- that's important here because the heart rate sensor needs to be against your skin to measure blood flow and give that all-important readout. The headphone wires draw together at a lanyard clip which also houses play, pause and volume controls. The clip is sturdy, and it's at the perfect point to tether to your t-shirt, making the wires less likely to get in the way -- at least while you're wearing it. 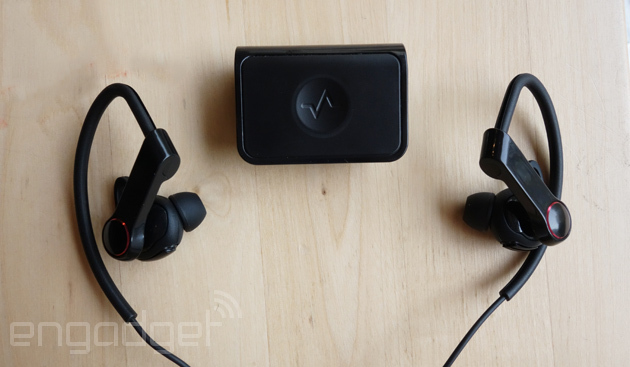 The earphones then plug into a Bluetooth module which provides the power and has its own clip; this one's waist-level. The module is small and light, with a backlit power switch that offers up a color-coded guide to your heart rate at a button press. (There's also audio guidance for battery levels and your activity, but I'll come back to that.) Despite their Bluetooth connectivity, that means there's just as much cabling as other wired earbuds. It would have been better if all the hardware was housed inside the headphones. Because the earphones connect through micro-USB to the Bluetooth module, it means you won't be able to use these with a typical headphone socket, which also means having to keep the set well charged. I found they lasted roughly four hours -- about four gym sessions of constantly monitoring my pulse. But you can expect them to last much longer if you're just listening to music. The heart rate module itself is lodged inside the right earbud, and there's a subtle design difference between the two buds, suggesting that the sensor points to your outer lobe rather than shining (infrared shines, right?) into your earhole. The results are accurate, especially compared to the erratic results we've seen from other heart rate sensors. During training sessions -- it only measures your pulse when you start a session from the app -- I also strapped myself into a blood pressure monitor at my local gym to get a second reading. Measurements from both were within one or two beats per minute of each other. What's nice, too, is that the earphones' heart rate reading doesn't fluctuate as much as wrist-worn monitors I've tried, probably because these stay more firmly in place. If you're curious about such things, you can view your readout in the app anytime. Alas, while the headphones make a pretty excellent heart rate monitor, the sound quality is distinctly trebly. Maybe my tastes tend toward Beats-style bass sound profiles, but compared to other in-ear buds, wired or wireless, these don't pack the same audio punch. My guess is something had to be sacrificed to make space for the heart rate sensors. Worse, at substantial volume there's a moderate degree of noise leakage. Gyms and outdoor running can often require the top volume, but move into a quieter area with other people and they'll soon twig to your shameless workout soundtrack -- the one you wouldn't ever make public. It's a shame, but sound quality appears to be a secondary concern here. To use the headphones you'll need LG's Fitness app, which does a lot of things right. There are both Android and iOS versions, meaning you can use it with nearly every modern smartphone capable of connecting to Bluetooth Smart. That might not seem like a big deal, but remember Nike's FuelBand was iOS-exclusive until very recently, and Samsung's Gear Fit will only work with Samsung phones. Four tabs guide you through a summary page for the day, week and month; an activity tab for calorie-based scrutiny; as well as a heart rate tab, workout tab and the (practically hidden) "more" tab, where you'll find most of the settings. This final tab is where you connect with third-party apps and compatible hardware. Cleverly, LG has offered cross-compatibility with MyFitnessPal, RunKeeper and MapMyFitness, apps that you might actually use. LG also supports a few third-party heart rate monitors, including devices from Polar and Zephyr. Alongside your daily activity and step counts (the app will keep a running total of your top "scores"), LG's Fitness app comes into its own with sessions: dedicated training segments you "set off" from the workout tab. There are no pretensions to sleep monitoring thankfully, or even diet guidance -- it sticks to movement. So I started moving. One swipe of the switch within the fourth tab starts things off. After that, you have the chance to toggle several mid-workout features. The GPS option monitors your running or cycling routes. As you move, your smartphone will track your route while color-coding your course depending on your heart rate (warmup, endurance, aerobic, anaerobic and high intensity). This same color-coded system, from hardly trying blue to gonna collapse red, is also replicated on the companion heart rate monitor's clip: one button press on the Bluetooth transmitter will show a color-coded notification illustrating how hard you're working. You can also get the app to narrate how many calories burned, distance traveled, current heart rate and more. The voice guide will specify your current beats per minute, but try not to laugh when the voice says "bits per minute." And if you can't help chuckling, you can fortunately turn the commentary off. Which I did. LG's Lifeband Touch is yet another fitness band -- and it's a hard sell. Announced at CES alongside the headphones, it's proof consumer tech never stands still, especially in nascent categories like wearables. Half a year later, we've seen products attempting to straddle the divide between fitness gadgets and smartwatches, with the best example so far being the imperfect Gear Fit from Samsung -- a fitness wearable paired with a beautiful screen and a heart rate monitor, albeit with a fuzzy interface and temperamental pulse readings. LG's band is friendlier but dumber. There's no OLED screen, but it works with both Android and iOS devices. No heart rate monitor, but then, that's the earphones' job. The Lifeband Touch is a solid, slightly flexible rubbery band with no clasp. Instead, there's a break in the band to slip your arm in -- it's a bangle, basically. It bends a little at the end, while the scrolling monochrome display and single button are both at the more solid end. 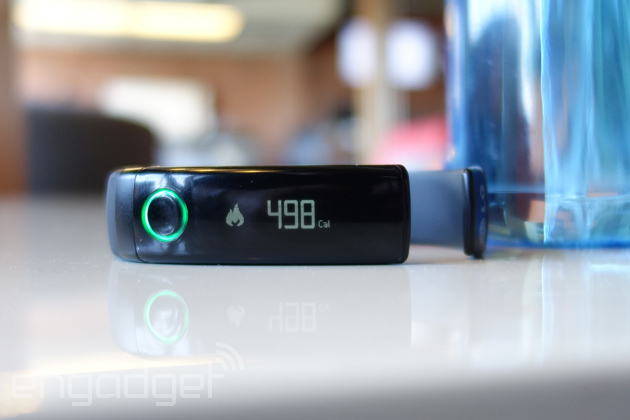 The device feels heavier than the FuelBand, which is probably its closest competitor. LG had the foresight to add a degree of motion detection, so if you raise your wrist, the device can either show the time or the option screen you saw last. I tried the Lifeband for a few weeks, but our review sample abruptly stopped charging; LG says we received a lemon. Even after a short testing period, I'm not desperate to use it again. Its biggest drawback is the dot-pixel screen, which is nigh-on unreadable in direct sunlight. While I haven't torn down the device to investigate, I think it's because the display appears to be pretty deep inside, meaning there's a lot of space (and glass) between the surface and what you're trying to read -- ideal for sunlight to refract and bounce around, making viewing your vitals trickier. Gesture controls be damned, you'll be cupping the Lifeband with your other hand in an attempt to read the time, your pulse or your step count. When you can finally make out the display, you'll notice three menu sections: one for battery, time and date; another for fitness stuff (calories, distances, steps, session tracking), and the last for controlling music playback. The interface and features are richer than the FuelBand, but Samsung's Gear Fit simply looks nicer, and with a color OLED touchscreen, is more technically accomplished even if the software is a muddled mess. Swiping through the Lifeband's touchscreen is a nice way to navigate the readouts, especially compared to the FuelBand's laborious button presses. That said, the Lifeband Touch already looks dated. It seems odd that it's appeared alongside the company's new headphones, which are pretty exciting. Well, as far as headphones go, anyway. I've never used a wrist-based heart rate monitor for an extended period because I find it uncomfortable having something attached tightly to my arm, so heart rate monitor headphones sounded like the perfect solution. 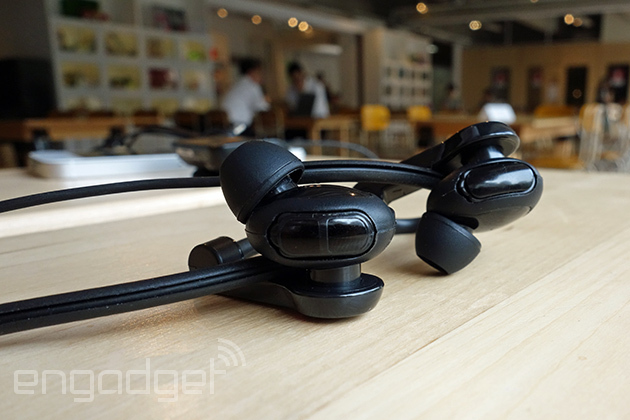 LG's earphones aren't quite perfect, though. I found the wiring between the earbuds themselves and the Bluetooth unit a bit unwieldy -- the cords were prone to tangling every time I took them off. For headphones, they're not cheap either: $180 at Best Buy. There's really no other device like it, however. Intel's smart ears are just a concept for now, while other options are either gestating in crowdfunding or outright hoaxes. LG's headphones, which you can buy today, give surprisingly accurate heart rate readings. Particularly thanks to the capable app, I can recommend them to fitness types who can't do without music -- just be prepared for some underwhelming audio.